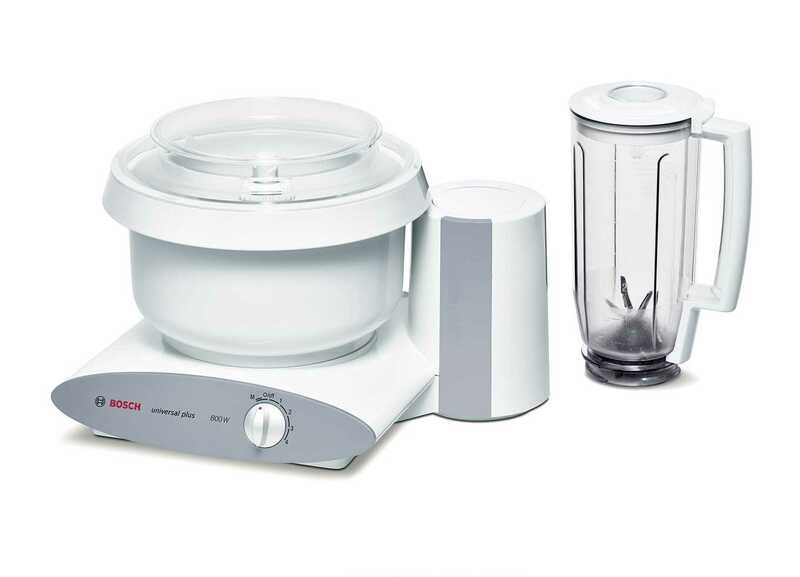 The Bosch Universal Plus Mixer has a sleek design that combines improved features and performance with the durability and dependability that we have come to know from Bosch. This new Bosch Mixer will adapt to any of your attachments that you have from any previous Bosch Universal Mixer. The new blender features a safety lock on the lid that will only let the blender work when the lid is in place. Increased power: 800 watts of power! With a simple and unique transmission this mixer will outperform other more powerfull mixers. More Speed Control: Now with 4 speeds! The slowest speed will gently incorporate flour and the highest is now even faster for greater performance. Greater Capacity: The Universal Plus Mixer features a domed lid that will allow you to mix 8 loaves of bread. Less Noise: Bosch found that if they enclosed the transmission it would increase the life by approximately 4 times! It has also decreased the volume to a very enjoyable level. Easy to clean: The Bosch Mixers unique drive shaft is now easily removable with a quick twist, which makes cleaning any job faster and easier. The whip drive is now made of a durable nylon which make it dishwashable and eliminates corosion completely. Easy to handle: The redesigned bowl has a handle which makes handling the bowl easy. The bowl now locks on, The Bosch Mixer base has suction cups that adhear to any surface making very stable performance. Improved Safety: Bosch is a company that prides itself in safety. The blender or cover must now be in place for the machine to operate.